A Jack Russell from Conwy county is through to the final of a national dog competition for his community visits to children and older people. Bodie attends a care home, school and hospice with his owner Eileen Hodge and was nominated for the Pets as Therapy (PAT) award by those he visits. Mrs Hodge, of Rhos on Sea, Conwy county, attributed his success to his temperament and love of people. 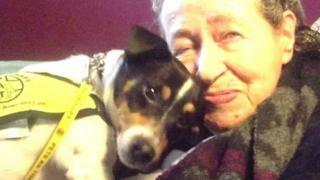 PAT was founded in 1983 providing therapeutic visits by dogs and cats. Mrs Hodge said Bodie got involved in PAT because one of her other four dogs also took part. "I'm retired now and decided I'd like to volunteer and I like my dogs to do something, to have a job," she said. Five-year-old Bodie visits elderly people in Merton Place Care Home, Colwyn Bay; Ty Gobaith Children's Hospice in Conwy; Llandrillo College in Rhos on Sea; and Ysgol y Foryd in Kinmel Bay. Mrs Hodge said he was a natural. "He loves people. He's got a lovely calm temperament and he nuzzles people like a cat would - older people adore him," she said. "With children he takes on how they want to be. If they want to play he'll play, but if they want to be quiet he'll just sit by them." Mrs Hodge is not sure who, or how many, of those they visit nominated Bodie for the award. "I just handed the forms out, but one 80-year-old lady who has MS did ask me to fill it in for her," she said. "I enjoy seeing how much people enjoy my dogs. I'm so proud of them and it never ceases to surprise me - they are so calm, laid back and friendly." Voting takes place between now and next March when Bodie will attend Crufts for the final. Anne Jones - the voluntary area co-ordinator for PAT covering Flintshire, north Denbighshire and Conwy - said: "As PAT is a national charity with about 5,000 dogs, for a dog from our area to get into the final six is fantastic." When Mrs Jones began working with the charity in 2008 there were seven volunteers on the books but there are now 42.